Looking for a screen to hire? 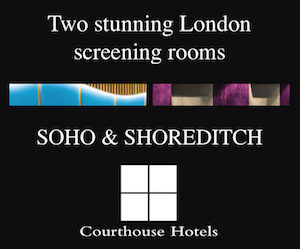 The Screening Room Map is the ideal venue directory for anyone looking to hire a screening room or cinema for a private event. The 2018 update includes a host of new screening venues for London, New York and Los Angeles. Explore the best resource for screening private hires. All featured venues are available for private screenings at hourly or daily rates. FILM | Includes 16mm, 35mm, 70mm reels. SD video | Standard Definition video includes DVD, DigiBeta, Beta SX/SP, DVC Pro. HD video | High Definition video includes HDV, HDCAM, HD SR, Blu-ray. DCP | Projectors with the Digital Cinema Package. DATA | Includes PC/Mac, PowerPoint, QuickTime, game consoles. 3D | Includes any type of film or digital 3D projection. 4K | Ultra high definition, 4,000 pixel horizontal resolution. IMAX | Widescreen, custom-venue format. For detailed projection specifications and rates, always check the web sites of specific venues.